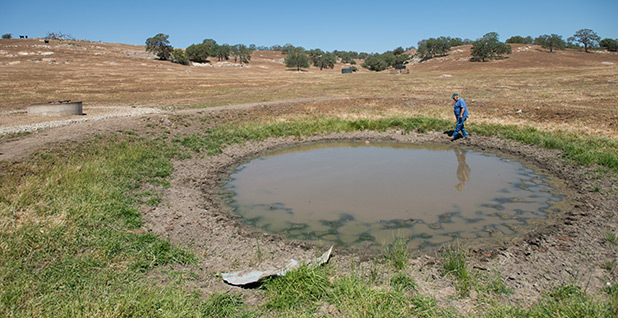 William O'Neal Jamison, the owner of a ranch in central California, checks a small pond that is in the process of drying up. While many cattle ranchers are selling off their herds, Jamison has gotten a Department of Agriculture grant to help him buy and install solar-powered pumps and deep wells to fill cement watering troughs, one of which is on the far left. Photo courtesy of the U.S. Department of Agriculture. A new study from climate scientists is the first to identify global warming's contribution to the drought currently ravaging California. The research, published today in Geophysical Research Letters, attempts to pinpoint the proportion of California's current drought that is being spurred by human-caused climate change. It finds that man's carbon emissions can be blamed for up to 27 percent of the drought's severity. The paper estimates how much more severe the drought has been, compared to a business-as-usual scenario. It uses measurements of evaporation as shorthand for warming's effects and finds that moisture has been disappearing from the soil at increasingly faster rates, to the point where the current drought is 8 to 27 percent drier than it would have been without climate change. "If we think of the water supply, precipitation, as being like income, and then water usage and evaporation being like expenses, then climate change's influence on evaporation has been like a bully that comes by your door every year and demands more and more money," said lead author Park Williams, a bioclimatologist at Columbia University's Lamont-Doherty Earth Observatory. By calculating soil moisture levels based on weather data taken all around the state from 1901 to 2014, Williams found that out of all the variables that affect evaporation -- including humidity, wind speed and solar radiation -- temperature is by far the biggest factor. The study predicts that evaporation will continue to increase with projections of rising temperatures. It finds that temperatures affected evaporation rates in the three-year period from 2012-14 more than any other three-year period on record, although one year -- 1934 -- may still hold the one-year record. This means that as temperatures increase, evaporation is expected to wreak havoc on precipitation after it hits the ground, regardless of how much rain and snow the state receives. The current drought is already threatening the state's agriculture industry, its wildlife and some of its poorest residents. The statewide impact to agriculture and related industries is $2.74 billion, up from $2.2 billion in 2014, according to a report released Tuesday from the University of California, Davis, Center for Watershed Sciences (E&ENews PM, Aug. 18). Meanwhile, a report released today by the Public Policy Institute of California finds that if the drought continues, low-income rural communities and ecosystems will see particularly severe consequences. The paper cites more than 2,000 dry wells reported as of last month, located in rural areas where municipal governments haven't made the investments in efficiency and supply that urban areas have. The drought will also continue to threaten fish and birds that depend on water habitat by forcing them into smaller areas with higher water temperatures, as well as exposing them to an increased risk of wildfire. "If the drought continues, emergency programs will need to be significantly expanded to get drinking water to rural residents and prevent major losses of waterbirds and extinctions of native fish species," said Jeffrey Mount, a senior fellow at the PPIC Water Policy Center. "California needs a longer-term effort to build drought resilience in the most vulnerable areas." "We know that the bully's going to continue demanding more and more from us, and that rate is going to increase really steadily and predictably," Williams said. "At some point, the amount that the bully is requiring is going to be such that only rarely will moisture conditions in California occur that would have been considered average conditions in the 1900s. Just the wettest years will be considered wet." While other studies have found significant mitigating effects on evaporation from factors like decreased wind speed and increased humidity, those effects weren't borne out in California. "We find that California doesn't really fit into that mold," Williams said. "Non-temperature variables have probably not had strong long-term trends, and it's been temperature that's been dominant in determining the [evaporation] trend." They found no perceptible statewide precipitation trend but found that average temperatures increased about 2.5 degrees Fahrenheit from 1901 to 2014. The paper doesn't examine whether the drought itself is being caused by climate change. Previous studies have determined that the ultimate cause of the drought is a region of abnormally high pressure off the Pacific Northwest coast that has blocked storms from reaching their habitual Northern California dumping grounds. "Although natural variability dominates, anthropogenic warming has substantially increased the overall likelihood of extreme California droughts," the paper says. Earlier studies have also examined the California drought's relationship to long-term warming by measuring evaporation. A Stanford University study in March found that high temperatures have made severe droughts twice as likely in the past two decades compared with the previous century (ClimateWire, March 3). A scientist who produced a paper earlier this year synthesizing the results of previous studies said the new study advances the line of inquiry into the relationship between climate change and the drought. "It takes it a step further and says, not only is the rising temperature due to human-induced climate change, but here's the quantitative evaluation of what it's doing to California's water," said Peter Gleick, president of the Pacific Institute, an Oakland-based water think tank. "I would describe this as an evolution in our understanding of the influence of climate change on extreme events. "We have droughts and floods naturally," he said. "The question is, is climate change influencing the drought? And if that's the question, I think the answer now is unambiguously yes."